It was a very different week in the Premiership, finally; a side gets their first home victory of the season and the battle for to avoid the relegation play-off spot is hotting up nicely. 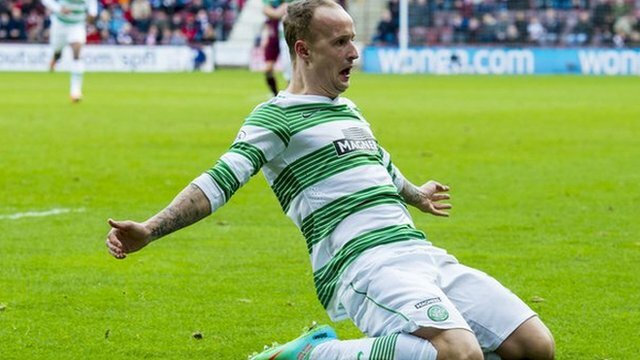 Celtic extended their lead in the table to 24 points. The Hoops remain unbeaten in the league campaign this season, this was the story, Saturday they went to bottom side Hearts and gabbed all three points yet again. Despite that, it was a landmark day from Fraser Forster in the Celtic goal, as he managed to equal Bobby Clark’s league record of 1,115 minutes without conceding a goal. The first half was poor in terms of action, with Van Dijk having the best opportunity but the Dutchman’s free-kick went wide of MacDonald’s right-hand post. The lead was taken just short of the hour mark, Griffiths latched onto a long clearance up the pitch, he turned Hearts’ skipper Danny Wilson inside out before rifling a shot across MacDonald into the bottom right-hand corner. Hearts search for the equaliser but it was all in vein, Nir Biton blocked Dale Carrick’s shot and another couple of efforts could not find the net for the home side. The points were sealed in the last minute of injury-time as both subs Pukki and Balde combined for the Finnish international to score his second goal in two outings at Tynecastle. In the Friday night game, Dundee United grabbed their second win in a row, with the comprehensive 3-1 victory of second-place hopefuls Motherwell. After some good opening pressure from the home side, the opening goal arrived 22 minutes in. Shaun Hutchinson’s calamitous back-pass allowed Ryan Dow to take advantage and give the Arabs the lead. A deserved second arrived just minutes before the break. Gunning made space, for the easy finish, Ciftci peeled away from his marker to nod across for the centre-back’s finish. Only a minute after the restart United found themselves three up. Gunning bagged his second against his former club. His powerful free-kick found its way beyond Nielson, via a deflection off James McFadden. Motherwell pulled one back from the spot as Ciftci handled in the area, allowing John Sutton to make the scoreline look a bit more respectable. Aberdeen failed to capitalise on that Motherwell loss, as they went down 3-1 at Firhill against Partick Thistle. The only main incident in the first 45 was, when the Dons missed a spot-kick in the opening 15 minutes. Adam Rooney was through one-on-one with Gallacher, as the striker tried to round the goalkeeper, and with minimal contact, the referee pointed to the spot. Barry Robson failed to convert and it would prove costly for the visitors. The opening goal came just before the hour, through the most unlikely of sources. Jags’ defender Conrad Balotoni , Aberdeen cleared a corner but it was played back into the box for Balotoni to fire past Langfield. Thistle doubled their lead five minutes later Lyle Taylor smashed home after Kallum Higginbotham’s cross. Aberdeen hit back two minutes later, McGinn’s free-kick was headed down into the ground and into the net. On the 72nd minute Thistle made the points safe and got that monkey off their back. Taylor grabbed his second of the day when his shot from the edge of the box found the bottom corner, to the delight of the home fans. Ross County went above St Mirren into 10th place as they beat the Paisley side 2-1 in Dingwall. The win eases the Staggies’ fears of being involved in the relegation play-off. Yoann Arquin gave the home side the lead before half-time. Michael Tidser picked out Arquin and he headed the home side into a lead, after they missed a host of first-half chances. McGinn equalised in the 66th minute, Gregg Wylde’s cross was cleared to the edge of the box, and McGinn’s smashed his right-foot effort home. The winner came just seven minutes from time. Arquin turned provider this time, crossing low and De Leeuw finished to grab the three points and deservedly so. Hibs moved closer to a top-six spot coming from behind to gain a point against Kilmarock at Rugby Park. In a close game between two equal sides, a draw was always going to be the most likely outcome on the day. The home side took the lead inside 20 minutes, after some superb control and a lovely pass inside the full-back from Kris Boyd, McKenzie got onto it before firing a low shot past Williams to give Killie the lead. On-loan Notts County striker Danny Haynes scored his first goal for Hibs as he cancelled out the opening goal with a great second-half header. Haynes managed to adjust himself to get his head to Stanton’s cross. Both sides had chances thereafter to win the game but 1-1 was a fair result in the end. Inverness managed a 1-0 away win at St Johnstone in a less than exciting match. It just about keeps Inverness’ hopes of a European spot alive. It also leaves St Johnstone looking over their shoulder at Hibs who are looking to displace them in the top six. Both sides had a few chances; Billy McKay had to be denied by Mannus, while Dean Brill did well to foil Hasselbaink. The only goal of the game came before half-time when Gary Warren rose above Rory Fallon, David Raven’s cross was nodded back by Foran for Warren to head home and get the three points for the Highland side. ← What is Strangling Serie A?